Since we last communicated it has been a hard slog. We lost Kim Seung-Won for seven weeks with strained knee ligaments which affected the balance of the team. Playing as false nine he was the top assist creator despite not scoring much himself. It wasn’t until he came back that we looked like our old selves again. As you can see from the results we have made hard work of things. The record for the past eight games stands at 3-3-2. 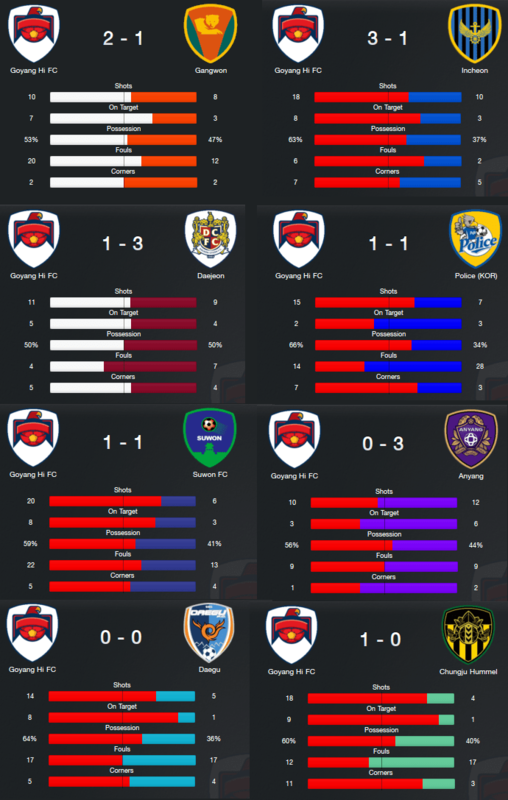 The two losses were particulary heavy and included the defeat to Daejeon who are breathing down our necks. In the same time Daejeon have looked impressive with a 6-1-1 record, including an 8-5 victory over Gangwon. The true extent of the slide can be seen here. Daejeon has pulled away from the pack and are playing good football. We have two games remaining against them and those two games could decide the outcome of the season. I have included a head to head table showing how we have done against all other teams. I have to say that it doesn’t look anywhere near as impressive as it did two months ago! Now we are getting to the pointy end of the season. We can not afford to drop any points here, and we are looking for help from the likes of the Police (ironic that) and Gangwon maybe to give us some respite. Of course we could just 8-0-0 these fixtures and make it a non contest. That would work too!. Finally the match summaries of the past eight matches.